“Everything You Were Looking For,” originally published at Bourbon Penn, is now a podcast at Podcastle, read by Wilson Fowlie. Issue 5 of inkscrawl is here! Issue 5 of the very-short speculative poetry magazine, inkscrawl, is here! This issue, guest edited by inkscrawl’s founder (and editor of the magic realist poetry ‘zine Through the Gate) Mitchell Hart, is an exquisite set of nine tiny poems that are bigger than they seem, with work by Adrienne J. Odasso, Michele Bannister, Sonya Taaffe and others. I’ll be returning to edit issue 6, which will have the theme of “The Journey.” Outbound, inward, what kind of journey can you take, depict, or embody in a very short poem? Issue 6 submissions will open on February 1. “Chandra’s Game,” a sort of Chinatown-in-Space story first published at Lone Star Stories, is now up at Escape Pod,read by Mur Lafferty (the pixel version is up as well, so you can follow along). You’ve got until tomorrow (November 15) to send poems to Stone Telling for the current open submissions period. We focus on fantasy, science fiction, surrealism, and slipstream, but would consider outstanding science poetry and non-speculative poetry that fits the flavor of the magazine. Send us your weird stories, your unclassifiable stories, your work that pushes the envelope. Send us your interstitial work, or something that falls neatly into genre lines. Whatever. As long as it has a speculative element (SF/F/H, magic realism, slipstream, fabulism, surrealism, etc.) we’ll read it. Challenge us. Make us pause in awe at the beauty of your craft and your extraordinary prose. Evoke wonder. …if you read the sf stories I’ve actually published in the Clockwork …you’ll see that there is some element of the bizarre and/or the avant garde and/or the poetic and/or the dream-like that permeate them. Most writers who tackle elements like this in their prose and plots choose to do it as fantasy, but it can also be incorporated into convincing science fiction, and when someone pulls it off it makes me very, very happy. Finally, Lois Tilton at Locus Online reviews the latest issue of Bourbon Penn. Of “Everything You Were Looking For,” she says: A story of powerful love and very old magic. The author creates a convincing narrative. Bourbon Penn is currently open to submissions – try them if you have something good and weird! My take on a Day of the Dead story (first published in the Hallowe’en -themed anthology Jack-o’-Spec from Raven Electrick), “Sugar Skulls,” is now a Miniature (won’t take long to listen!) at Podcastle. The story is beneath the cut if you’d like to read along. Tiny little story rec: “Small Adjustments” by Rheea Mukherjee at Every Day Fiction. Strange Horizons Fund Drive – 3 days left! There’s a little over three days left to contribute to the 2012 Strange Horizons fund drive. Strange Horizons has been online for 12 years, pays professional rates, publishes all matter of fiction, poetry, reviews and essays and is dependent on reader donations. If you’ve enjoyed what they offer, please consider donation any amount whatsoever – you’ll be in the running for some cool prizes, including (ahem) my poetry collection, The House of Forever. And much other wonderful stuff too! Look! and donate! 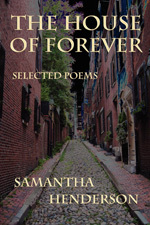 My first collection of poetry, The House of Forever, is now available from Amazon and Barnes and Noble! Many thanks to Karen Romanko of Raven Electrick Ink, who edited the collection and whose photography is featured on the cover. I’ll be participating in a Hallowe’en-themed poetry reading at the Summer Studios in Lomita this Friday, October 26 at 7 pm, along with Denise Dumars, Deborah Kolodji, Scott Virtes, and Nancy Ellis Taylor. I’m told there will be food and booze! And if the UPS gods smile on me, I’ll have copies available of the collection. Samantha Henderson’s poetry tastes like titanium-edged kisses, sounds like a bow drawn across the violin of the frontal lobe, across the bass of the reptile brain. Her poetry feels like a long-fingered hand in your chest, closed around your heart, squeezing its own rhythm. Her poetry smells like death, like life; its scent is memory. Read these poems, consume these poems, then look in the mirror at yourself, at the ghost of yourself. You will see her poetry in your eyes. I am interested in stories that are exciting, thoughtful – and, most of all, imaginative. As a reader, I am often frustrated by how human-like or dull aliens are. Show me something unexpected and wonderful. Things I am not interested in: stories that use aliens as a shallow analog of racism and race relations here on Earth. I believe that the narrow focus of some previous science fiction anthologies actively harms the genre and the people within it. I am therefore very interested in hearing about stories by people of every gender, race, sexual orientation, religion and nationality. The deadline is October 15 – Alex is also interested in suggestions of stories that meet the above criteria, so if you’ve read any stories that do a bang-up job with Aliens, let her know!